This month marks the 30th year of Virginia Wine Month—the oldest wine month in the U.S.—the annual month-long celebration of the Commonwealth’s wine industry. 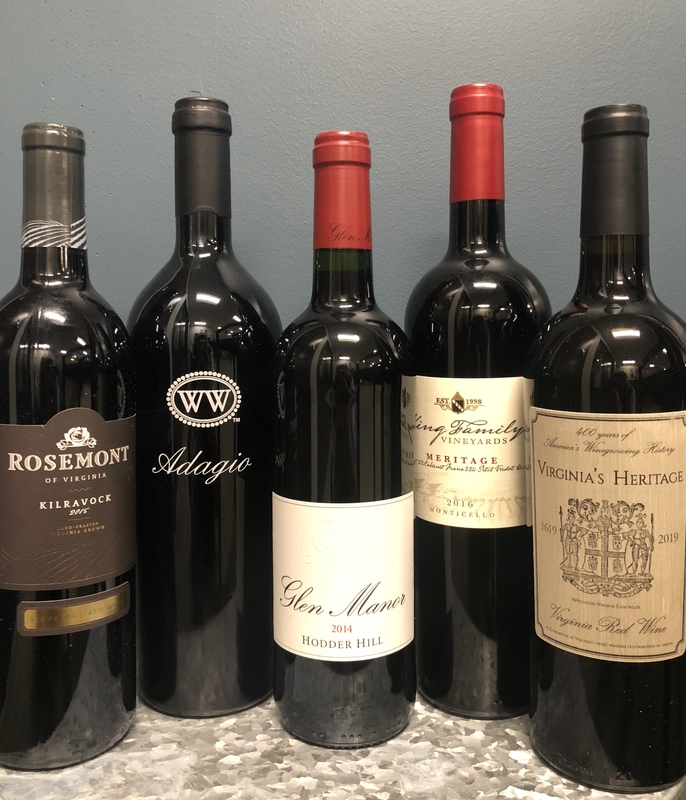 To officially kick-off the 30th Virginia Wine Month, I partnered with the Marketing Office of the Virginia Wine Board for the 51st edition of Virginia Wine Chat featuring five of the state’s premier Bordeaux-style red blends. Virginia Wine Chat is the monthly winemaker interview and virtual tasting series I started in 2013 to bring attention to Virginia wines, wineries and winemakers. Each month, I interview a notable Virginia winemaker while tasting three of his/her wines and stream a video of the interview live online. Wine enthusiasts from around the U.S. watch the live interview while tasting the same wines and asking questions via Twitter. Rather than interviewing winemakers for the Virginia Wine Month kick-off ‘chat, I asked two wine professionals—Caroline Hermann, Master of Wine, and Swati Bose, owner of Flight Wine Bar in Washington, DC— to join me to taste and discuss five of Virginia’s premier red Bordeaux-style blends. Swati and her husband and partner, Kabir Amir, graciously hosted our group of a dozen local wine writers at Flight Wine Bar for the evening. These five compelling Bordeaux-style red blends represent collaboration and showcase Virginia’s potential for fine wine. Envisioned and organized by Chris Pearmund, owner of Pearmund Cellars and Effingham Manor & Winery and Vint Hill, Virginia’s Heritage is a collaborative, commemorative Bordeaux-style red blend that includes juice from 16 wineries. Each of the 16 wineries contributed one barrel of Cabernet Franc, Cabernet Sauvignon, Merlot or Petit Verdot from 2016 or 2017. Virginia’s Heritage is a nod to the 400th anniversary of Acte 12, passed by the House of Burgess in 1619, requiring all colonists to plant ten grapevines. Only 10,000 bottles of Virginia’s Heritage were produced, representing the 10,000 grapevines brought to the Virginia by the Virginia Company 400 years ago. Virginia’s Heritage was bottled at Effingham Manor & Winery and will be available purchase at the 16 participating wineries: Philip Carter Winery, Pearmund Cellars, Cooper Vineyards, Aspen Dale, Effingham Manor, Glasshouse Winery, Ingleside Vineyards, Naked Mountain Vineyards, Narmada Winery, New Kent Winery, Potomac Point Winery, Rappahannock Cellars, Rosemont of Virginia, Vint Hill Winery, Williamsburg Winery, Winery at Bull Run. Dark ruby color offering notes of brambly fruits and spice with violets on the edges. It’s big with pronounced flavors of dark fruits among the spice and earthy notes. This is an important wine because it offers a taste of Virginia and serves as an example of the potential of collaboration amongst winemakers. Well done, Chris and team! Jeff White and his team farm 17 acres of vines on the 212-acre farm his great grandfather purchased in 1901 in Front Royal. Situated on steep-sloped hills (up to 40% grade) on the western side of the Blue Ridge Mountains reaching an elevation of 1,300 feet, the vineyards at Glen Manor are some of the most special in Virginia. White’s 2009 Hodder Hill won the 2012 Governor’s Cup. Elegant and complex, the 2014 Hodder Hill is full of dark berries, dried herbs, violet and tobacco, underscored by cassis and earth. Lovely acidity and lengthy dark berry finish. Such an elegant and special wine. The name Kilravock (pronounced kill-rock) comes from the castle in Scotland from where the Rose family traces their roots. Located in Southern Virginia, just north of the North Carolina-Virginia border, equidistant between I-95 and 85, Rosemont is one of the most underrated wineries in the Commonwealth. Thanks to coverage in The Washington Post and other publications (and, maybe Virginia Wine Chat? ), the word about Rosemont’s quality is getting out beyond just the local wine geeks. The 450-acre Rosemont property has been in the Rose Family since 1858 and is today home to 22 acres of vines. All Rosemont wines are made from grapes grown in the estate vineyards. Rosemont’s flagship red, Kilravock is big, bold and balanced. Beautiful aromatics, blackberry and ripe plum, dried herbs, black tea and baking spice with berry and earthy flavors. Notable tannins but well integrated, lovely acidity. Dark ruby color in the glass, this wine is complex with a beautiful aromatic profile of dark berries, spice, tobacco leaf, cedar and violets with flavors of smoked berries, dried herbs, cocoa powder and cranberry. The finish is long with smokey notes at the end. Solid tannins and structure. A stunning wine that will age with grace. Early Virginia wine pioneers, Patrick and Peggy Duffeler purchased the 300-acre Wessex Hundred property in Williamsburg in 1983. Today, Williamsburg Winery is one of the largest and most noted wineries in the Commonwealth. Winemaker Matthew Meyer and his team farm over 42 acres of vines at the Williamsburg Winery estate vineyard, Wessex Hundred. Five of those acres are planted to Petit Verdot. As much as any grape, the thick-skinned, late ripening Petit Verdot is thriving in the vineyards around Virginia and especially in the clay and sandy loam soils at Wessex Hundred. Petit Verdot is the foundation of Adagio, Williamsburg’s flagship red blend, and also used to make two varietal bottlings. In 2014, the 2010 Adagio won the Virginia Governor’s Cup (25 years since their last Cup win). Dark garnet color in the glass, this aromatically charming wine offers notes of spice, dark berries, nutmeg, cocoa, and hints of lilac. On the palate, flavors of baking spice, violet, plum, and vanilla lead to a lengthy savory meat finish. Robust tannins and acidity. Thank you to each winery that participated in the October Virginia Wine Month Kick-off Virginia Wine Chat. A special thank you to Caroline Hermann, MW, for sharing her expertise and to Swati Bose for sharing her expertise and opening her wine bar for us on Sunday evening. A big thank you to Megan Womack and Anna Pendleton of the Virginia Wine Board Marketing Office for joining us, providing the great food spread and making this event happen! Very much appreciated. Virginia Wine Time — October is Virginia Wine Month!